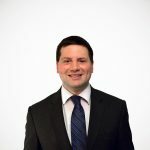 While corporate income taxes are often mistaken for the totality of business tax burdens, in reality they are just one of many taxes paid by businesses, and often a relatively small percentage of overall corporate tax burdens. Nationwide, corporate income taxes only account for 3.5 percent of state and local tax revenue. That figure will continue to decline as more businesses organize as pass-throughs (S corps, partnerships, sole proprietorships, etc. ), which are liable under the individual income tax code, and as more C corporations receive incentives and abatements which erode the corporate income tax base. 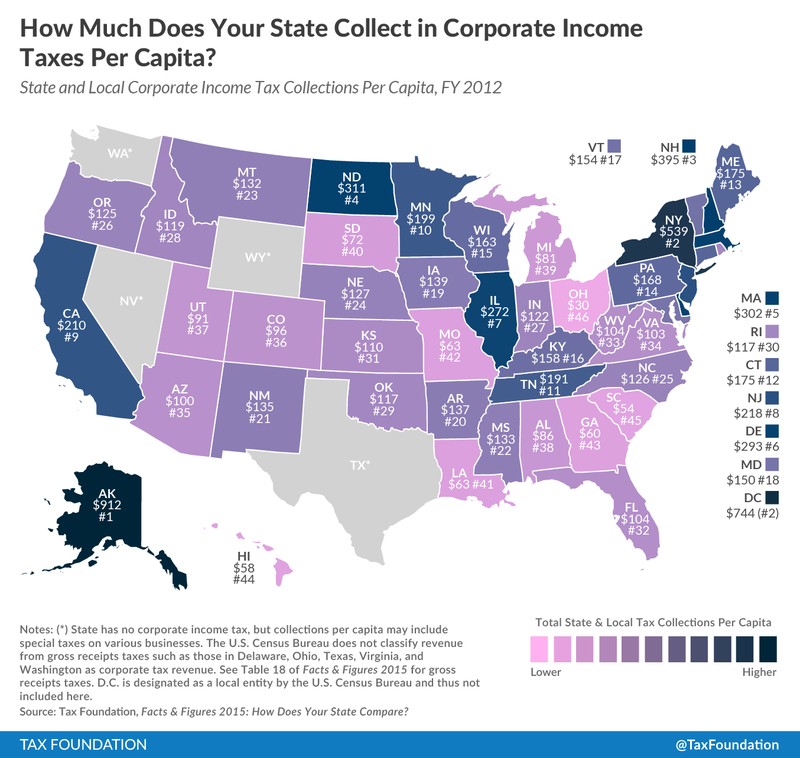 Today’s map shows how much each state collects in corporate income taxes per capita. Unsurprisingly, states like New York ($539 per capita) collect a great deal, due to a heavy concentration of corporate payers. Alaska has the highest collections per capita ($912), the result of a large presence from extractive industries combined with relatively low population. A similar dynamic is at play in fourth-ranked North Dakota, while third-ranked New Hampshire leans more heavily on corporate taxes (and property taxes) due to the lack of an individual income tax (except on interest and dividends) or a sales tax. At the other end of the spectrum, Nevada, Ohio, South Dakota, Texas, Washington, and Wyoming do not levy corporate income taxes, though four of these states (Nevada, Ohio, Texas, and Washington) instead impose economically distortive gross receipts taxes, and some states that forego a traditional corporate income tax still show a small amount of corporate income tax due to taxes on the corporate net income of special kinds of corporations (e.g., financial institutions). As such, only Nevada, Texas, and Wyoming show no revenue whatsoever from corporate income taxes, though all three of these states levy other business taxes, including, inter alia, Nevada’s Commerce Tax (a gross receipts tax) and Modified Business Tax (a payroll tax) and Texas’s Margin Tax (a gross receipts tax). The number of businesses organized as traditional C corporations has decreased over time. Between 1980 and 2010, the number of pass-through businesses nearly tripled, while the number of C corps actually declined. States hand out generous corporate tax incentive packages to entice businesses to move into (or remain in) their states. Jobs credits, investment credits, and other targeted incentives lower tax liability for certain businesses and industries, but they are distortionary and non-neutral, picking winners and losers while carving away at the tax base. States further reduce corporate tax bills by adjusting income apportionment formulas, reducing the in-state taxable income of corporations within their borders. Our Location Matters study helps explain the effect of apportionment in each state. Beyond their limited capacity to raise revenue in most states, corporate income taxes are also highly volatile, as many corporations post losses during economic downturns and thus have no liability under the corporate income tax.